105 mm square newel caps with a subtle pyramid shape on top to give them a more decorative look and feel. Newel caps are the perfect way to finish a plain newel post. These pyramid style newel caps provide a simple but effective design choice to finish square newel posts, and they can be fitted on the top of newel posts or at the bottom when the newel drops below the height of the floor. 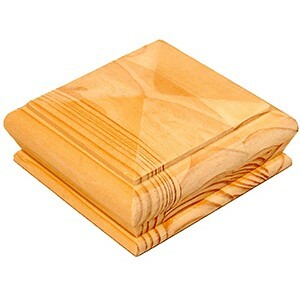 They are available in a choice of woods, to suit your stair design. Our selection of timbers includes hemlock, pine, white oak, ash and sapele. These pyramid newel caps are available in a range of sizes to accommodate different sizes of square newel posts. These newel caps range from 95mm x 95mm, to suit standard 90mm x 90mm newel posts, up to 150mm x 150mm, to suit larger newels, often used for grander staircases.